A United Launch Alliance Atlas 5 rocket with the Air Force's X-37B Orbital Test Vehicle (OTV) - inside the bulbous nose cone - the rolls out to its Space Launch Complex-41 launch pad at the Cape Canaveral Air Force Station in Florida on April 21, 2010. An unmanned rocket rolled out to its seaside launch pad in Florida today carrying a secretive robotic X-37B space plane for the United States Air Force ahead of a planned Thursday launch. The United Launch Alliance, which is providing the Atlas 5rocket launching X-37B into space, rolled the booster out to Space LaunchComplex-41 at the Air Force Station at 11 a.m. EDT (1500 GMT) today. The robotic X-37Bspace plane looks like a miniature space shuttle and even has a smallpayload like NASA's orbiters. It weighs about11,000 pounds and is just over 29 feet in length. It stands slightly more than9 1/2 feet in height and has a wingspan just over 14 feet across. But unlike its bigger space shuttle brethren, the X-37B isdesigned to fly unmanned and remain in orbit for up to 270 days. NASA shuttle missionstypically carry up to seven astronauts and last around two weeks. Air Force officials have kept the details of this X-37Bmission ? called the OrbitalTest Vehicle ? and the spacecraft's cost secret. Gary Payton, the U.S. AirForce Deputy Under Secretary for Space Programs, told reporters Tuesdaythat the mission will test a new batch ofreusable technologies, including new silica heat shield tiles to protect thespace plane from atmospheric re-entry, as well as "other technologies thatare sort of one generation beyond the shuttle." Payton said the X-37B isdesigned to re-enter and land autonomously, without any direction from missioncontrollers after starting its descent from orbit. The mini-shuttle is expectedto land at the Vandenberg Air Force Base in California at the end of its debuttest flight, he added. The X-37B was built byBoeing's Phantom Works division in Seal Beach, Calif. 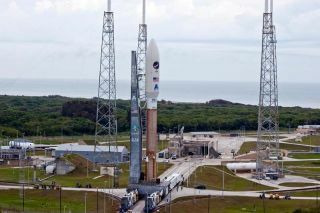 The Air Force has alreadyordered a second Orbital Test Vehicle, but whether it launches in 2011 as plannedhinges on the performance of the upcomingtest flight, Air Force officials said.